Being off sick with the flu, and fed up of being in bed and reading, I decided to try and do this today. May not be my best work, but it was enjoyable to make and actually fits my mood right now. This is a self-playing modular synth track, using three sequencers that are interacting, attenuated and sampled at different time points to derive three related sequences, in a minor key. There are also occasional key changes, derived from a fourth sequencer. The three voices were set up to have dark timbres and have slow attacks, with lots of soft modulations to keep some interest. I actually wrote/posted this a couple days ago, but in my head it fits the challenge so perfectly that I had to post it here. The “piano” melody is Just Friends in Sound/Sustain running into a 3 Sisters. The sequencing is done by Orca, an alt firmware for Monomes White Whale. There is a subtle feedback loop that builds as things move along, and a portion of the melody looped and reversed on the ER-301. For me sad music is not a wandering motivator at all, all the contrary. So for this junto challenge “Make a short piece of music that encourages the mind’s tendency to wander” I didn’t choose a sad piece, but one that’s been waiting to be finished for over a year, because I considered too wandering. SO here it is, a divagating fusion piece, with no clear tonal focus, many melody glimpses that never establish completely, and to make it “worst”, something I use sometimes to create a wandering, dreamy feeling that keeps calling somewhere else from the music albeit being part of it: spoken voices mumbling around. “Humanity is living tremendous days. but when you want to focus on that timless idea, it just vanishes. So go ahead and wander with this one. Wanted to test out some new virtual instruments anyway so this one was too good to resist! Chose Cello, Clarinet and Violin to have good tonal difference, but tried to cluster harmonies close together mostly. Generally improvised trying to get a sense of undecidedness. When I saw “instruments able to produce very small intervals and dark timbres”, I read “homemade Schmitt trigger oscillator network and RC filter” … If this doesn’t help your mind to wander, maybe nothing will?! I sampled a Bmin chord with my guitar, then play with the sample. I totally move into something psychedelic. Don’t know if it still fits the constraints. The theme of wandering is a common one in pop songcraft, exploring a range of sensibilities that don’t always evoke listless melancholy. Suss Müsik would argue that these songs are less about wandering and more to do with purposeful distraction. A true wanderer travels seemingly without intention, drawn by cognitive impulses that cannot be explained. “Even I never know where I go when my eyes are closed,” sang XTC in 1989, quite possibly the most resonant lyric on daydreaming ever written. For this intentionally unstructured piece, Suss Müsik played a series of random, minor-key chords on the piano. Quick blasts of clarinet, violin and fake strings were added and mixed to create a sort of phasing effect. Things go nowhere for a while, like a typical daydream, only to end in an unresolved state. You’ll likely forget you ever heard it. The piece is titled Raichle after the neuroscientist Marcus Raichle. Dr. Raichle’s work uncovers what he calls the “dark energy” of the brain: electrical patterns emitted during periods of sleep, daydreaming or surgical anesthesia. The image is a magnification of kava tea. First part is bass and oboe, second part switches out the bass for a cello (which seems to have a weird sound to me). I tries to apply stuff I learned in the Russo book that some of the disquiet members are studying. The first part is meant to be in E Phrygian then going to D Phrygian and then back to E. The second part follows some slowly arpeggiated 7th cords (one note per measure). Suss Müsik agrees with you. There is something exquisitely uplifting when listening to music that would fit Dr. Taruffi’s description of “sad” music. Frankly, there is nothing more irritating than being subjected to “happy” music when one isn’t quite in the mood to hear it. So dope when the drums kick in! Cooked up a tune this afternoon. I first made a sampler instrument in Live 10 with a short recording of my girlfriend playing the clarinet, so that’s the main element, chord-y stuff. The same instrument is used to make up a bass voice in the middle section of the track. I then pitched some piano recordings I’ve done in the past and fed them into the re:mix app and improvised some variations of that. Lastly I sampled some Schubert (a string quartet in A minor) from YouTube and played around with that with Morphagene. A rather slow, dark and ambient track. BPM is 66. 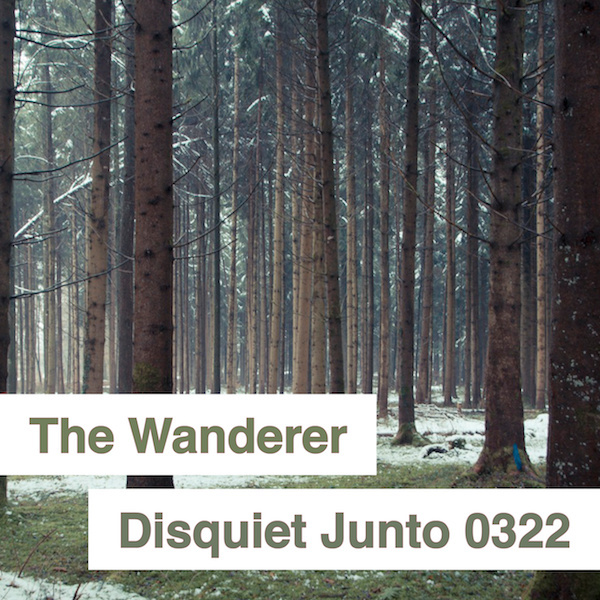 Here’s my contribution to the Disquiet Junto Project 0322. The brief was to make music that encourages the mind’s tendency to wander, again based on a research paper that looked at characteristics of types of music that might evoke this. The constraints this week were to be entirely instrumental, with dark timbres and small intervals, with suggestions of cello, violin, viola, piano, oboe, horn, clarinet. Not having any of these kicking around, I used a sampled piano in Native Instruments Kontakt, used the cello waveform for two parts from the Intellijel Shapeshifter module, and a Mannequins Mangrove/Three Sisters combination for the horn part, together with some drone work produced by an Error Instruments Black Noise and Mutable Instruments Rings. Perhaps most challenging personally was the need to get all these parts playing essentially a four part harmony in a minor key. I typically don’t formally ‘compose’ anything, so it was a great exercise to do. Minor key wanderings using the three instruments out of the instrument list (piano, cello, clarinet) on this week’s project. I couldn’t help myself and added effects on top, but left them small enough that they might not even be noticeable. I admit I didn’t fully understand whether small intervals meant intervals between note presence or intervals between pitches so I kind of ignored both. Haven’t done a homework in a while, so this was fun!